The vote counts are a great tool to determine whether an answer is disputed or not. 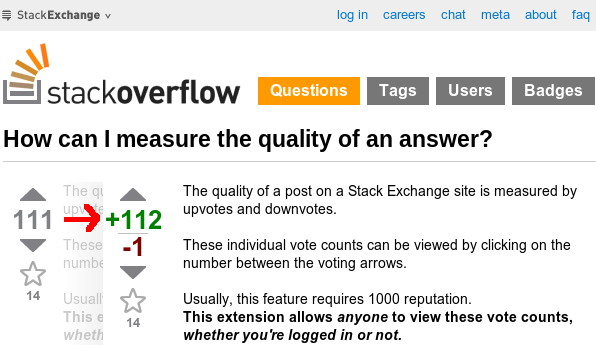 Unfortunately, not many of us have enough time to join all Stack Exchange websites and get 1000 reputation. This script unlocks the "View Vote counts" feature for those who are not logged in or don't have 1k reputation. The look and feeling of the feature is identical to the original one. Recognises posts at questions, question lists, /review/ pages and search results. Creative Commons 3.0 SA - Same as footer. You may modify and distribute this script S, provided that you mention the original author of the script A.
Chrome extension in the Chrome Web Store, "View Vote totals" without 1000 rep. Please send your feedback to rob@robwu.nl. When the Vote counts feature is disabled, the Vote counts buttons don't have a tooltip. The script checks for the existence of the tooltip, and adds the feature when necessary. If the tooltips already exist, the script does not add any visible modifications to the page. A detailed explanation of the code is listed in the source code (direct link, or via the overview page). The change log is listed at the overview page. Go to a tag page, for example this one. Find the vote and answer count on the left. So now I'm reporting it. Can we get a setting to show the counts automatically without clicking? It doesn't work for the new Stack Overflow em Português. This will catch SO and SOpt and their respective Meta sites. This script is no longer working as of yesterday (12/20/2018) for me on any SE site, it looks like StackExchange redesigned the voting buttons. Clicking on the score of a post now has no effect whatsoever. I'm using Chrome 71 on Windows 10 if it matters. It looks like this script was broken by the same UI change that made the vote buttons bigger. Is it possible to view vote counts on Area51 proposal questions? It would be helpful to see where the followers are being stingy with each other, and then open a question to discuss it. Can you include new images for this script? Not the answer you're looking for? Browse other questions tagged script chrome-extensions greasemonkey bookmarklet .